loo-PYE-nus tex-IN-sis Seeds @ 1lb./1,000 sq. ft.
Lupinus texensis (loo-PYE-nus tex-IN-sis) . HABIT: Flowers have wonderful fragrance. Blue 2 - 4 spikes of fragrant flowers in spring. Upright to sprawling spring wildflower. Germinates from seed in fall, leaves and stems hairy. Flowers have wonderful fragrance. CULTURE: Sometimes hard to get going but once established is reliable each year. Plant seed in summer. 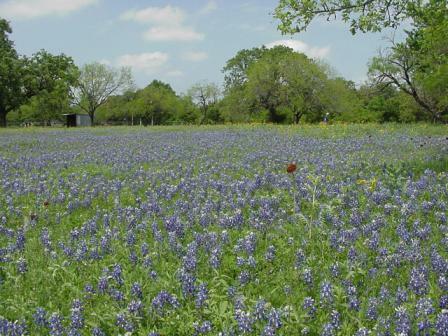 PROBLEMS: Wet soil, high fertility, and shade are not friends of bluebonnets. NOTES: Do not fertilize wildflowers. Native to Texas. Nurseries are now selling 2 1/4" pots for planting small garden areas. Best time to plant seed is midsummer as nature does. Named for its color and resemblance of petals to a woman's sunbonnet. Blooms in the early spring and can be found in fields and along the roadsides throughout central and south Texas. The bluebonnet is also called buffalo clover, wolf flower, and (by the Mexicans) el conejo. It was adopted as the official state flower by the Texas Legislature in 1901. The average bluebonnet plant produces 100 seeds, giving the possibility of that many new plants. One single bluebonnet plant will produce up to 40 blooming flower heads. Each bloom results in 7 - 20 seedpods. Each pod will have 3 - 5 seeds. Allowing a conservative average of 5 blooms per plant, 5 pods per bloom and 4 seeds in each pod, that gives 100 seeds per plant (dependent on a myriad of factors like soil condition, amount of sun and animal/human foot traffic. 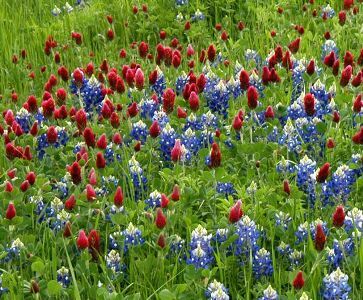 Encourage those with oversize of any large-scale mowing operations to spare bluebonnet patches until seeds fly out when you walk through them, which would indicate their maturity. With just an additional week or two in delay of mowing operations, the Metroplex will reap the benefit next spring with an abundance of every kind of wildflower. Over a period of several years, it can be anticipated that a super abundance of bluebonnets if there is widespread acceptance of this practice. Bluebonnet Trivia: The white spot on the flower is to attract bees to pollinate. Once the flower has been pollinated, the spot turns red so the bees will know to go to another flower. Bees visit the flowers that have the spot turned red much less often then flowers that have a white spot.